eGuide to Spain - Clarinda Parques S.L. Ever since the 1960s and 1970s, the country has been a popular destination for summer holidays, especially with large numbers of tourists from the United Kingdom, France, Germany, Italy, the Benelux, and the United States, among others. Accordingly, Spain's foreign tourist industry has grown into the second-biggest in the world. As of february 2019, Spain holds 1st place in the World at international tourism ranking The TourismRank. In 2018, Spain was the second most visited country in the world, recording 82.8 million tourists which marked the sixth consecutive year of record-beating numbers. Spain ranks first among 136 countries in the biannual Travel and Tourism Competitiveness Index published by the World Economic Forum in 2017, matching the top position already achieved in 2015. Spain is the second largest country in the European Union. Its latitude puts part of the country in direct contact with the typical southern end of the Atlantic polar jet. 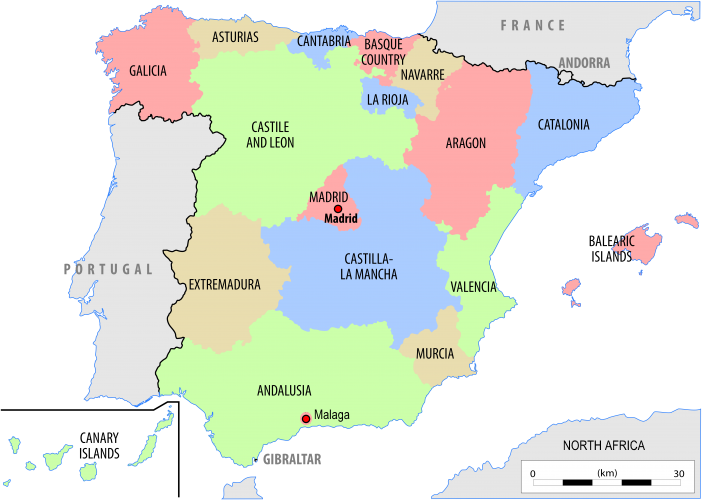 Hence, Spain's geographical position allows for Atlantic fronts typically affecting its western and northern part whereas a Mediterranean influenced climate is generally prevalent in its eastern and southern parts, with transition climates linking both main bioclimatic regions. Additionally the presence of several mountain ranges ultimately shape the diverse landscape of Spain. Another remarkable feature of the country is its vast coast, as a result of being in a Peninsula; moreover, there is the coast of the two Spanish archipelagos: the Balearic Islands and the Canary Islands. The Picos de Europa National Park in the Green Spain. To date, Spain has a total of 15 National Parks, of which 10 are on the mainland with our local park "Sierria de los Nieves", 1 in the Balearic Islands and 4 in the Canary Islands. Spain's most visited National Park is the Teide National Park in the Canary Islands, with 3,142,148 visitors in 2007 and crowned with the third largest Volcano in the world from its base, the Teide, with 3,718 meters above the sea level (also the highest point in Spain). The Teide also has the distinction of being the most visited national park in Europe and second in the world. In Spain, you’ll find the journey you’re looking for. Unique, exclusive experiences, with the finest services and amenities there for you to use. You won’t need to worry about anything - simply enjoy yourself. A memorable trip you’ll want to repeat.